Hi all - I'm wondering what might be a good gift for a gamer who already has a lot of games. I've given him games in the past, so I'd really like to come up with something different this time. Are there any handy accessories or useful items you can think of that any board gamer would/should like to own? A dice tower. Just in order to throw something out there. Some beautiful dice, perhaps? The Dice Shop has an impressive assortment. Maybe some storage accessories for games..
has really cool upgrade kits and inserts as well. Do a search for a Cajon Drum Bag. 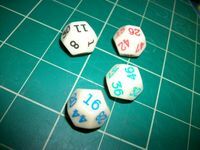 They are inexpensive, most are padded, and the perfect size for hauling games around. I don't have any art from Displate yet, but I think one of these would make an awesome gift. There are a lot of artists, this link takes you to one of them but if you want to look though more just start from their homepage. Steam has several digital versions of popular board games. You could gift a board game to them and then you will have a way to play online with them when you can't make it over. I am not sure what shipping turnaround would be like from any of these shops tho. If you know their favorite board games and know how to use Photoshop-like software you can put together a collage of their favorites and have it printed out at Kinkos as a poster. A pair of suede slippers with sheepskin lining. Very comfortable for the avid gamer. A framed portrait of Reiner Knizia? how about a bag of Cheetos to eat while you play his games? The slippers are a nice gift but they should be velvet and monogrammed, now that's classy. How about a signed autograph of the rules to his favorite game? You can never have enough card sleeves. Wow, how was I unaware of this product! Nicely done posters that are public domain per the artist. A nice framed poster for his favorite game would be nice if he has a game room. I was going to suggest a bag of Cheetos, because it's something no gamer is going to buy for themselves. To play is human; to win, divine. Best gift I would love to receive as a gamer is the gift of time to play games. Any of these things, nicely made, would be a welcome addition at my game table.